In my most recent newsletter, I shared the story of a custom hairpiece I created for a client. When the project was complete, I realized the individual components were strong enough to stand on their own, and so they have evolved into a new collection I call Julie’s Garden. The new line honors a friend of mine who recently lost her battle with cancer. She loved flowers and nature, and I think it is fitting that she be remembered in this way. This week, I want to share some of the new pieces with you. I hope you like them as much as I do! 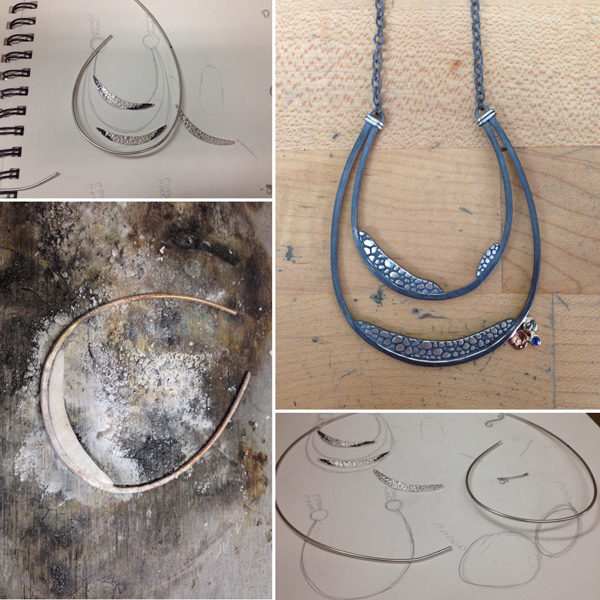 This is a start-to-finish collage of Fragrant Spring, necklaces inspired by the hairpiece. They are made from sterling silver, beach pebbles and beads. 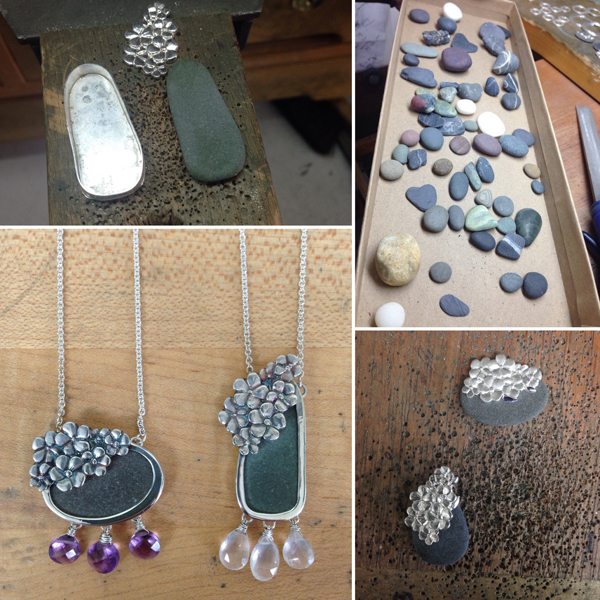 This collage is of Pebble Landscape, another necklace in the collection. It is made with sterling silver, 14K yellow gold and sapphires. 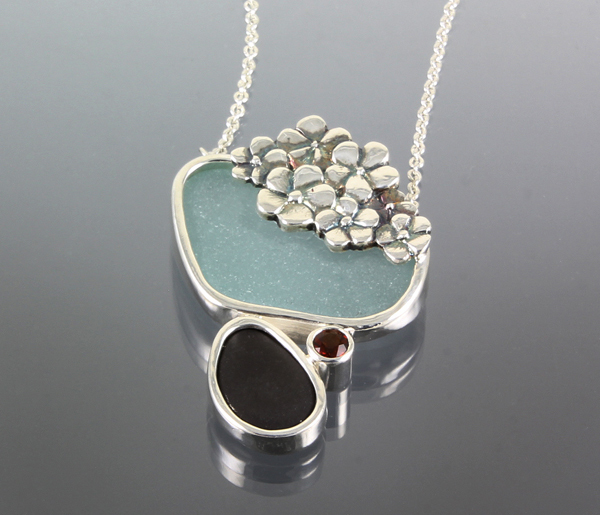 This is one of my favorites from the collection; it is made from sterling silver, sea glass, beach pebble and garnet. I created it for a close friend who was also close to Julie. The sea glass comes from Maine, and garnet was her birthstone. As a gift to his wife, a client asked me to create a hairpiece using a garden theme. Inspired by her love of gardening, I spent several weeks looking at pictures, sketching flowers and plants, and working to create the most beautiful composition. I finally settled on a detailed piece with five different plants that we agreed were perfect for his wife: sunflowers, cosmos, yarrow, phlox and sedum. The proceeding weeks involved hours of precise wax carving to get the floral details just right. Then I was ready to cast the separate pieces that would then be trimmed and smoothed. 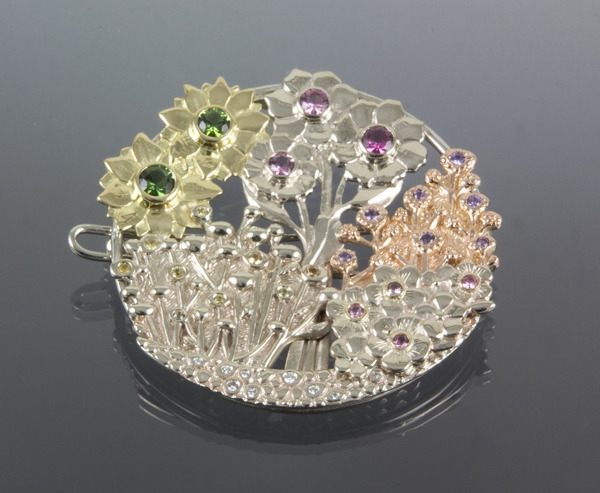 I chose 18K white, rose and yellow gold with Maine amethysts, sapphires and diamonds that came together in colorful bouquet! It was an inspiring project, and we were both wild about the finished product and confident his wife would love it…and she did! I really enjoyed working on the piece and loved not only the finished product but also the detail of the separate elements. I realized they were substantial and interesting enough to easily stand alone, and so, a new series was born. I am calling the collection Julie’s Garden in honor of a close friend who recently passed away after a yearlong battle with cancer. She loved flowers and nature, and I can’t think of a better way to recognize her. I’ll share some of the individual pieces soon, so check back in!